Welcome to Wow. Sorry I don't have features to share this week. I explained why in this morning's post sharing the top six most viewed. Be sure to check and see if your link was one of them. I am sure many of your homes look like this right now, too. I hate a mess in the house and so I am working hard to get this all done and cleaned up. Got burlap? I have plenty. Actually bought too much, but hey I am sure it will eventually get used. And this was delivered today. I finally got Mr. Savvy to break down and buy a new fridge. Our other one was seventeen years old and worked fine, but the ice maker went out years ago so it will be nice not to have to use trays anymore. Also just a reminder that I am part of a group of bloggers who are hosting "A Homespun Christmas" link party and I am first up with vignettes and mantels. The party should go up around 8 p.m. eastern time Saturday 12-1 so get your posts ready to share. 1. Please have a separate link to this party in your post (not a mass link page) or add my party button from the sidebar to the post. If there is not a separate link you will not be featured and/or could be deleted. I am hopefully bringing you traffic and I would appreciate the same. Hope you will join me on FACEBOOK. Kim...I can totally relate on ready to have the boxes tucked away!!! Thanks for hosting!! Thank you so much for hosting, Kim! I know you are busy (but loving every minute)! I'm sure once you sort through all of your boxes, your home will be decorated beautifully for the holidays!! Congrats on your new fridge! My house still looks like a bomb went off and it's driving me nuts!! Thanks for hosting Kim! Thanks for hosting Kim. YAY on the new fridge. WOW you sure got your life at the other one. Glad you got your ice machine - just in time for holiday cocktail season! Thanks for hosting the party! I love the Christmas decorations on your blog header! Enjoy that new refrigerator! Thanks for the party again this week, Kim. I can't wait too be done decorating for the holidays. I can't walk ten feet without tripping on something. Kim, I'm right there with ya! Boxes are everywhere! Thnaks so much for hosting. Love the new fridge! Thanks for hosting Kim! My dining room looks half like this right now! I have to go clean it up! I can't wait to see your home decorated for the holidays! Looks like a whole lot of great things in those boxes... Your new fridge is so pretty. I'm hoping one of these days ours will stop working so I have an excuse to go buy a white one. ;-) Have a wonderful evening! Happy Decorating! And thank you so much for hosting this party! My house looks worse! but I'm getting there. I hope to have something ready for the party Saturday. Thanks for hosting Kim. I hate a messy house too! I can't wait to see what your Christmas decor looks like this year!Thanks for hosting! Besides thanking you for hosting, let me just cut right to the chase here: I SO ENVY YOU THE NEW FRIDGE....IT IS BEAUTIFUL!!! I have threatened, promised, cajoled, etc. to get the Headmaster to get a new one for our 'cottage' in Wisconsin, but...NOOOOO! I, too, am tired of the trays (and truly thought I was the ONLY one with them). LOVE your blog, and thank you for all of your inspiration! Thanks for hosting, Kim! I'm sorry your house is in disarray, but I feel your pain. I'm right there with you. Hope you have a great week and I know it will all come together quickly and beautifully. I am on the same page, except that I am decorating my mom's house and my own. Just got back after three hours decorating at her house and there is still more to be done. As much fun as it is, I keep thinking ~ we have to put this all away when the holidays are over! Oh, well, we do it anyway don't we? Thanks for hosting Kim. Looking forward to all of the special parties. Yes, looks familiar! I have so much going on I don't have time to finish before I'm going on a road trip. Thanks for hosting. I did some selective photography for the breakfast room shoot today. Lots of clutter in the background and it is beginning to bug me. Can't wait to see your tree! yep, I hear ya, I'm still decorating and the basement is a disaster area. Just linked up, thanks for hosting, Kim! Thanks for hosting, Kim. That first shot looks familiar. Hmmmmm, oh yes, that's what my house looks like. Thanks for hosting. Looks like the fridge is a great early Christmas present. My house looked like yours last week and I still have some decorating to do! There's always too many boxes. I have the sun room to complete and then I'm done! I can sit back and relax, enjoy, bake, etc.. ;) Enjoy the new fridge! I know I can't wait to get ours. Kim, I couldn't take the mess either, so I decorated my tree and mantle in record time and got it out of here. I'm leaving some space in case I decide to add some new things. Thanks so much for hosting! Thanks so much for hosting! Enjoy decorating this week! My house is a decorating mess too! Thanks so much for hosting! I agree with liking to get the boxes put away. It is always fun to get everything out and feels so good to be finished. Enjoy the fun! Kim, my house looks waaaaay worse than yours! It's driving me crazy, too. Leo told me to take a photo of it but I said NO WAY! I'm going to try to finish most of it tomorrow. Love your new fridge with the freezer on the bottom! Thanks for hosting, Kim! I can totally relate about the mess that holiday decorating creates. Ugh! Thank you so much for the lovely party once again...had to come back and comment a little late...I linked up from my phone at dinner ;) Girl, Christmas has completely taken over our house. We are moving the mess from one room to the other til it finally makes it's way out to the garage. Thank you for hosting despite all the craziness this holiday season can bring. I like your new fridge! Thanks for hosting this party...can't wait to link up with the Holiday Mantle party! I so feel for you right now. The mess with the decorations going up and coming down is awful. Inspires me to get it done FAST :-) I know it will look great when you're done!! Lordy I'm late but I made it. Thanks for hosting when you are so busy. Love the new fridge too! Thanks for hosting, Kim. I've gotten so many page views the past two weeks from your party. I try to be organized and stay with decorating one room at a time. Somehow I always end up jumping around and creating a mess. lol! 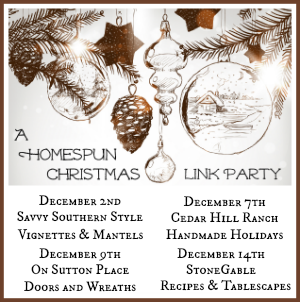 Looking forward to the Homespun party. Thanks for hosting. Thank you so much for hosting your party! Hi Kim: Thank you for hosting. I know what you mean--my dining room and living room are upside down right now, until I get things decorated! I'm super busy with life this week, but am trying to work away at it when I can. Take care, and have a wonderful rest of the week. LOVE the new fridge. I keep thinking mine will go into fridge heaven but nooooo. Its hanging in their on life support. LOL Can't wait to see all your Christmas decor. Last year's was beautiful and I know we are in for a real treat! Hi Kim, this is a great party - lots of Christmas and lots of painted furniture (my fav's). Thanks for hosting. That was a lovely roll of burlap. Can't have too much on hand! I have motivation to decorate our mantel now! Thank you SO much for hosting all this wonderful inspiration! OH MY!I can relate! I have been tripping over decoration boxes since Friday. It is driving me crazy! I am hoping to finally have it all done by this weekend. The top six are certainly worth taking a peek ok, so all's well that ends well. Now get the mess cleaned up. Then come tell me to get mine cleaned up too. Otherwise we are both going to have to come up with a clever way to decorate bins for Christmas. Love the holly on the header! Very festive! Hi Kimmie! Oh, my goodness! I'm # 331! What a party you're having today. Love your new fridge and thank you for hosint. Kim....wow, your party is growing. I haven't started decorating yet....Ive have got to get busy! Thanks for another greatparty Kim! Oh my! So many links! Love it! Thanks so much for hosting, Kim! I so want that refrigerator!!! Way to go Mr. Savvy! I'm sure your Christmas decor is looking awesome and the mess will be put away before long! Thanks for hosting and congrats on the new fridge! Kim somehow your house still looks nice even though you think it's messy. Mine looks like a bomb went off!!! Love the new fridge!! meow! OMG Kim.... I can't tell you how much time I've spent on your WOW us Wednesday!! What a great idea. Just sent your link to 4 of my non-blogger friends. We just got the same refrigerator a few months ago and I just love it. Never thought I would love and appliance so much. Hope your decorating is going smoothly. I better start some housework - I've been "wowed" by your blog for the past 2 hours! I always find such great ideas and new blogs at your party. Thanks. oh my gosh, so much beautiful! I have not been commenting but please know I NEVER miss a post, you are such a treat to visit!I cracked my collar bone and its my right hand. Doing the same over here with the mess~ thanks for hosting! Hi Kim, I love seeing the behind-the-scenes shots of your house! Makes me feel a little better about my own mess, and would you believe I haven't even gotten a lot of my Christmas decorations out yet? Not sure where the time goes each day. In any case, great link ups again, as usual. Thanks for hosting. Have a great week, and enjoy that new fridge! Thanks for hosting..Decorating also means messes. Resting my back. So glad to see the first two pictures in this post. That's exactly what my house looks like. I love Christmas, but I hate the night quite decorated stage. Sadly, I still have Halloween stuff out. Where did November go?? LOL we'll all be ready for Christmas by February! Thanks for the party Kim! Why is the ice maker always the first thing to stop working! Congrats on the new fridge - I know what a pain ice trays can be. Thank you for hosting another great party! My house always looks like that too! Then- beautiful! The French Hen's have joined your blog and enjoy it so much. We would love for you to join our blog as well. I could not agree with you more, I hate mess in my house! It makes me nervous! I am sure that everything is going to look fabulous when you are finished. Thank you for hosting a beautiful party! I hope I fashionably late to the party :) Some great guests!! Going to visit now!! Mornin' Kim....I'm so glad to be joining you this week, since I wasn't able to join last week. Looks like I'll be up late tonight exploring so many enticing entries. Have a great weekend! Thanks for hosting. I can't wait to see your Christmas Decorations. Fantastic party, Kim! Thanks for hosting. I'm going to be spending a lot of time here looking at all the pretties!